Here’s a Tuesday Art Day that is not necessarily WoW-related, if you’ll forgive me! This is my glacially leveling SWTOR sage, Nima. Like all of my “main” characters, she is blue and has Freckles. Well, she’s sort of a turquoise. But the freckles are essential. The blue thing is the punchline of a recent From Draenor With Love – I like things and people that are blue with a disproportionate love. I don’t know why, but it’s always been true! I haven’t really been playing SWTOR very much, when I have a hankering to play a game lately I’ve logged into WoW, but I’m sure we’ll pick it up again soon. It’s been an enjoyable game for the two of us leveling together, the story is quite engaging. The few instances we’ve done have been fun. Nima herself is pretty awesome, Voss said she is stuck-up but I don’t see that. 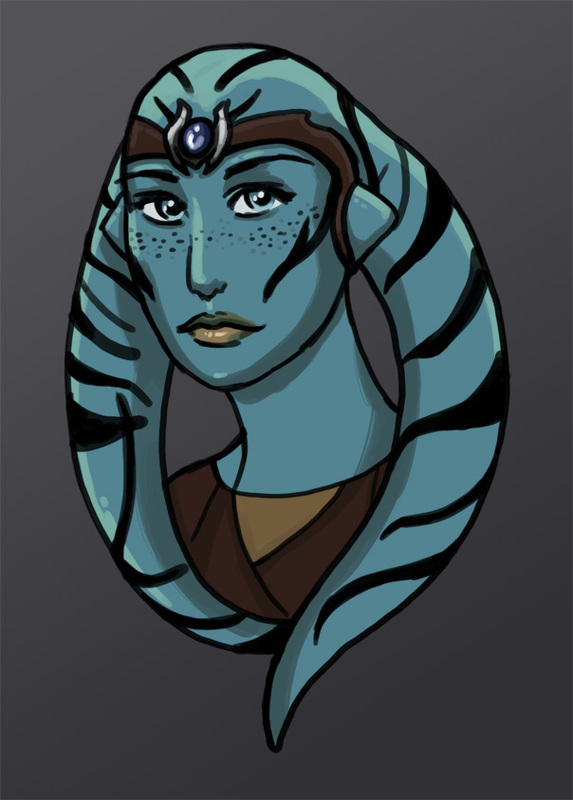 In a world where Twi’lek are often exploited (and even slaves) she has to work especially hard at making it pretty clear that there’s no price in the galaxy that is worth her integrity. Also, she will throw a droid in your face. DROID TO THE FACE. So she’s straightforward, no-nonsense and a bit of a hardass. She trusts the Force, and that’s pretty much it.